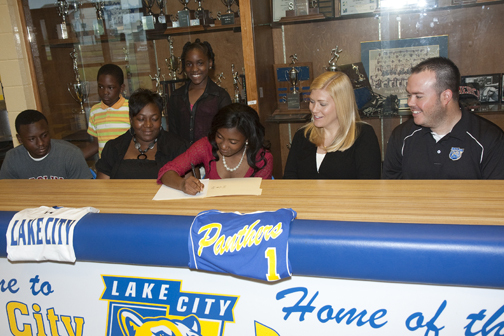 LAKE CITY, SC – Lake City High School softball player, Nijla Miller, signed a National Letter of Intent Thursday to play softball at USC-Salkehatchie. A four-year varsity starter, Miller batted .412 this season with 16 RBIs and six stolen bases. She was named to the 2012 All Region Team for Division 7-2A and was the team’s Defensive MVP in 2012. She was also named to the school’s All-Academic Team. “During her four years at Lake City High School, Najla has been a model student-athlete,” said Panthers head coach Erin Poston. 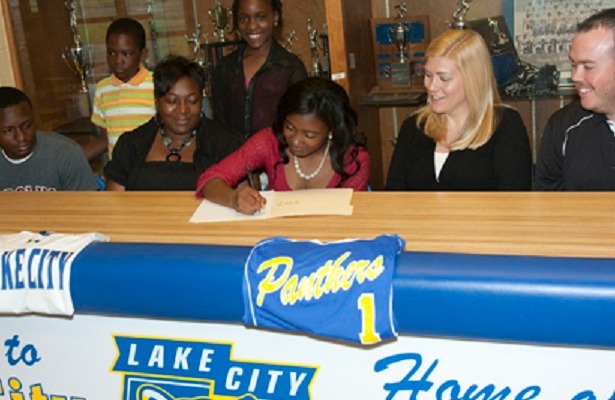 “She has improved every year on the softball diamond and tremendous growth potential at USC-Salkehatchie. With her combination of speed and power, we expect great things from her in the next few years. Naj has been a rock for our program and will be truly missed,” Poston added.